Tell us about yourself.I am 44 years old, married. I am a mechanical engineer by trade, and a former combat engineer with the 17eme RGP (Regiment Genie Parachutiste, French Paratroops). No, I was a chubby kid, not into sports at all. Except for my time in the military I struggled with my weight until the mid 30’s when I turned to dieting, exercise and eventually found running. 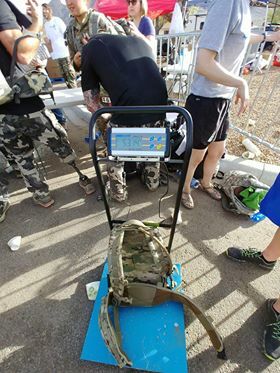 My event was the 2018 (76th) Bataan Memorial Death March. The march commemorates the Bataan death march and the atrocities endured by U.S. and Filipino POWs after the 14th Imperial Army took the Philippines over in 1942. I competed in the Civilian Heavy division (35 lbs weight minimum). I completed the event in 9 hours 33 minutes. 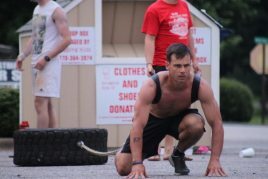 In my event about half the participants were active-duty military or wounded warriors I found that so inspiring. Mineral Hill, definitely. I did not really trained for rucking on hills and figured I could rely on my trail running legs instead. That was a miscalculation on my part. Honestly, the last 6 miles or so. By mile 20 my expectations were that my shoulders and back would be killing me, my feet would be blistered, and I dreaded the sandbox. Hinstead by mile 20, I had found my rhythm, my shoulders were completely numb and good feet management meant I had no blisters. I was (relatively) pain-free overall. Quitting this event was never an option when I entered the event. I had nothing to complain about, I have 2 legs and no-one was going to bayonet me. I was surrounded by warriors, many of whom had a story of survival and / or overcoming. In the tougher moments of the march I did think about the the US and Filipino prisoners that went through the real death march. How it must have felt knowing that if you stopped you died, wondering if I would had made it through in the real march, because I felt weak to even have a tough moments. FIND a GORUCK event near you—CLICK HERE or on the banner above! How did you stay motivated throughout the race? I broke down the event in my head, basically from aid station to aid station. I had heard a lot about “the sandbox” which is later in the course so I kept looking forward to reaching the sandbox. Once I did reach the sandbox, I knew the finish was just a few miles off. 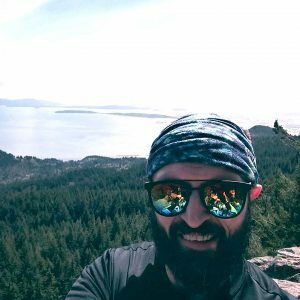 I started alternating rucking and running, alternating rucking with short burst of running. Being able to do that after 7-8 hours on the course gave me mental boost that lasted tot he end. When I was having a hard time on mineral hill I was still passing some participants. I recall one amputee in particular. I told her she is doing a good job on the way up. Later I had stopped and was trying to relieve my back, my ruck was still on. She caught up to me and smiled. I had it in my head I needed to stop and rest at the next aid station (1 mile away), but she inspired me to keep pushing hard so I rucked the rest of the hill without stopping (a few more miles). The deal I made with myself is that I would finish the mineral loop then come down the road then I could stop for afew minutes. And I had to do it smiling. I also made short video clips describing how I felt, what was going … whatever caught my attention or was bothering me. I used my GORUCK Rucker 2.0, with a 45 Lbs plate. I tricked up my ruck with a Condor Gen II belt (the large contact area distributes the weight on my lower back and hips more efficiently.) I used a 3L bladder for my water. I had an extra 20 ounces plastic bottle I used to refill Gatorade at aid stations. This was a desert event, so I made sure my clothes covered as much of my body as possible (basically had my whole body covered except my knees). I carried an extra buff that I could use to shield my face through sandstorm (I used it several times on the course). I also carried desert goggles in case we ran into a bad sandstorm (didn’t have to use them). I wore sunglasses to protect my eyes the whole event. My footwear was my Garmont T8 Bifida tactical boots, and I wore Injini 2.0 midweight crew socks. I completed SGPT RASP 1.0, Started SGPT Total Training 2.0. My rucking training was about 300 some miles over 4.5 months at 45# weight. I did that through the Team Spearhead Pathfinder Advanced classes. 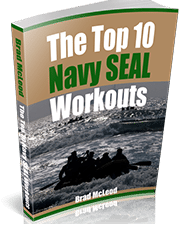 To get my body used to the weight I completed many WODs with my ruck. About 3 weeks out I started wearing my boots everyday to work. I also worked out in my boots. I rigged my desk into a standing desk and spent my working time standing up I the boots. Even though I wasn’t wearing my ruck at the office I wanted to spend as much time as possible standing up in the boots to get my feet really used to be in the boots for 9-10 hours in a row and know every possible hotspot on my feet so I could protect these hotspots adequately before the event. About a week and half out I started heat acclimating. Here in the PNW the hottest day so far had been low 50’s while the event reached into the 90’s. I found a 1-2 weeks heat acclimation phase before a desert event helps my body dealing with desert heat tremendously. I would had spent more time rucking hills. 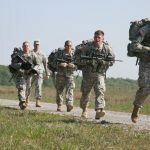 I focused too much on my rucking pace on flat ground in my training. I sat half a day on the flight home, which left me really tight. So I took it easy for a few days then slowly got back into my work out routine. Any tips for someone wanting to train for and enter this event? Get to know your feet … I saw several people on the side of the trail dealing with feet problems. Ideally you shouldn’t run into issues with your feet if you know how to mange them well. Blisters are not cool. Book accommodations way in advance. I didn’t have a place to stay the Saturday nigh before the event because all the rooms in the area were booked. I was able to hookup with a group of fellow Pathfinders that were camping on base, but still having a plan for the night before would had save me some unnecessary stress. Desert RATS Kokopelli 150 Stage Foot Race in June 2018. “Tears In The Darkness” by Michael Norman and Elizabeth Norman. It’s a book on the story of Bataan. QUESTION: Coach McLeod—do you have a list of backpacks you recommend for a GORUCK event or a list of ones you like in general? ANSWER: Yes—we have a couple of articles for you. Top 10 Backpacks for the GORUCK Event and Top 10 Special Forces Backpack Reviews. 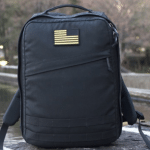 You can also find our GORUCK military discount code here. QUESTION: I’ve gotten some new boots for training and rucking. Last time I broke new boots in my feet got chewed up by blisters. Do you have some tips for me to use so this doesn’t happen again? Thanks! ANSWER: Yes; Tips to Toughen Your Feet. Also, GORUCK Foot Care Tips.